Sheffield Music Hub's Festival Choir is for children aged 7 - 13 (Y3 - Y9) who enjoy singing and performing and who love a challenge! Since its launch in September 2016, Festival Choir has gone from strength to strength. We are pleased to now have a core group of children of around 40-50 who perform at city wide venues and collaborate to create exciting concerts. It offers a chance to have the very best possible introduction to singing at the highest level in a range of singing styles. Children from all walks of life are welcome to join; all we ask is that they enjoy singing and are prepared for the challenge of developing their ability whilst having fun! Members receive tutoring to develop pitch, tone and sense of rhythm, and are encouraged to learn to read music, while working towards memorable performances at Sheffield Music Hub events and other exciting concerts. Festival Choir is conducted by Sheffield Music Hub's vocal specialists Laura Steelyard and Caroline Hallam. Festival Choir is partnered with and supported by Hallmark of Harmony. 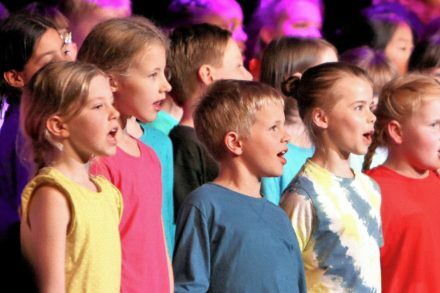 Festival Choir is for children aged 7 to 13 years (in school years 3-9) who love singing and are prepared for the challenge of developing their ability whilst having fun! There are 5 rehearsals each term on a Sunday afternoon from 1:30pm - 4pm at The University of Sheffield Diamond Building - Workroom 1. Membership is £30 per term or £80 for the year. To sign up please click here.